Kool-Aid Man by http://brands.kraftfoods.com/koolaid/: published here under the principle of Fair use (educational, nonprofit); original image on Wikipedia. Nebraska designated Kool-Aid as the official state soft drink in 1998. Kool-Aid is an artificially fruit-flavored powder developed in 1927 by Edwin E. Perkins and his wife Kitty of Hastings, Nebraska (Edwin was founder and president of the Perkins Products Company). Hastings sponsors a yearly festival called Kool-Aid Days in August to honor their city's claim to fame. Kool-Aid brand is now owned by the Kraft Foods Company. 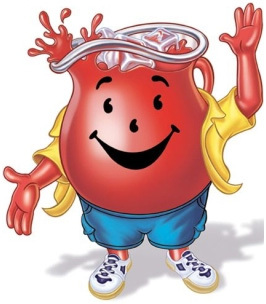 Kool-Aid's mascot and logo is Kool-Aid Man, a character with the body of a large frosty glass pitcher filled with Kool-Aid (usually cherry). He was introduced in Kool-Aid advertising shortly after General Foods acquired the brand in 1953. In Television and printed ads, Kool-Aid Man was known for bursting suddenly through walls while children were making or drinking Kool-Aid to say his catch phrase: "Oh, yeah!" Nebraska also recognizes milk as the state beverage, acknowledging the importance of the dairy industry to Nebraska's agricultural economy. 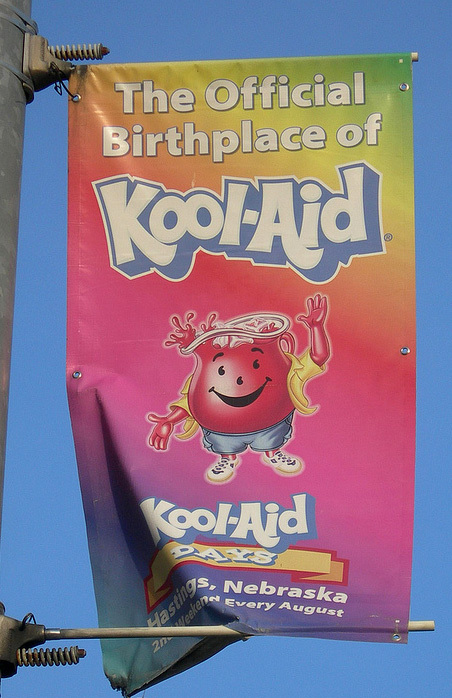 Kool Aid Banner in Hastings, Nebraska (the official birthplace of Kool-Aid); photo by Jimmy Emerson, DVM on Flickr (noncommercial use permitted with attribution / no derivative works).